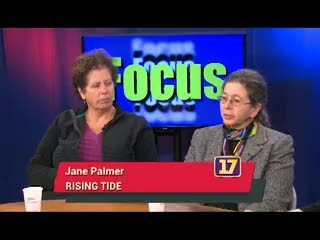 Channel 17 host Margaret Harrington gets together with Kevin Kamps, of Beyond Nuclear, Jane Palmer, of Rising Tide, Vermont, and Dr. Rachel Smolker, of Protect Geprag's Park, to talk about the unification of the Dakota Oil Access Pipeline Protest with the Fracked Gas Pipeline Protest in Addison County, Vermont. The activists emphasize the main similarity, which is that corporate interests take precedence over the needs and wishes of the people and the environment. Elected officials and those running for office are noncommittal. President Obama states he will wait to see how the Dakota Pipeline plays out while 140 Native American protesters are arrested and caged by law enforcement officers from seven states. Meanwhile, the Bundy Clan, who took over federal land by armed violence, have been acquitted by a federal jury.